A good baker will rise to the occasion, it’s the yeast they can do! Okay enough laughter, let’s get serious. 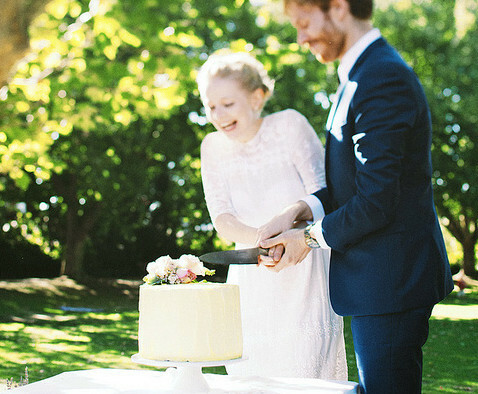 This is my all time, stress free wedding cake recipe. Now listen, its only stress-free if you plan. Follow the steps below, and may god have mercy on your soul. This plan is for a wedding that falls on a Saturday. Get yourself into the zone. Clear your mind. Eat everything in your fridge, (you will thank yourself come Thursday). Tell your boyfriend / housemates that you love them and to not take anything you say after Wednesday literally. You’re going to turn into a mega w(b)itch! Eat a good meal as it will be your last chance to use your kitchen for nutrition until Saturday, and by then you’ll roll in drunk and eat an entire bag of frozen dim sims. Go to the supermarket and purchase your cake ingredients as well as a bag of frozen dim sims. 1 bag of frozen dim sims. Let’s bake! 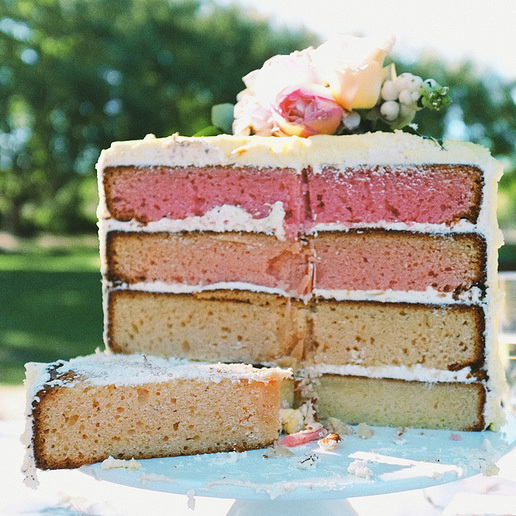 Out of the 4 tiers, you are only going to bake two tiers tonight. You work hard all day, so set yourself easy goals. The instructions below are for each tier, which we’ll repeat 4 times in different colours. Don’t try and double or triple the mixture. Baking this cake is a science. Don’t EFF with it! Pre-heat the oven to 170 degrees and line the bottom of a 10″ x 3″ round cake tin with baking paper. Place 400g of white chocolate, 265g of butter, 1 1/3 cup of milk, 1 tsp of vanilla essence and 1 cup of sugar in a heavy saucepan and simmer on a low heat. Stir until the chocolate is melted and the sugar has dissolved. Set aside to cool for 5 minutes then whisk in 2 eggs and 1 egg yolk. In a large bowl, sift together 1 cup of self raising flour and 1 1/3 cup of plain flour. Make a well and slowly pour in the chocolate mixture. Fold slowly until combined. Pour into the lined cake tin and cook for 35 – 40 minutes, or until golden. Test by poking a skewer into the centre. It should come out nice and clean. Repeat. In the second cake mixture, add 1 drop of red food colouring. Let cakes cool and store in an air tight container. Let’s face it, you’ve gone to after-work drinks, you’re tipsy, you’ve forgotten to eat dinner. Now is the time to crack into that bag of dim sims. Okay. This cake won’t ice itself! For this cake, you will need to make at least four batches of the following ricing recipe. Three batches for the crumb coat and one batch for decorating. Again, don’t try and double it. Just make extra batches as you need it. In a stand mixer, place 370g of butter and whip it for about 5 minutes until it is pale and smooth. Alternating, slowly add 5 cups of icing sugar, 1 tsp of vanilla essence and 4 tbs of milk. Mix until light and fluffy. Take all four cakes and cut off the top dome. Make the cakes nice and flat and even. Arrange in order of colour. Light to dark. Dollop a blob of icing sugar on your cake tray. Flip your lightest cake (least pink) upside down so that the nice flat bottom is facing upwards and place it in the centre of your cake tray. Take a big scoop of your icing and start to fill and crumb coat your cake. Place the next cake on top, ice and repeat until your cake is filled and crumb coated. Once the icing on your cake is firm to the touch, you are ready for the last (and FUN stage). 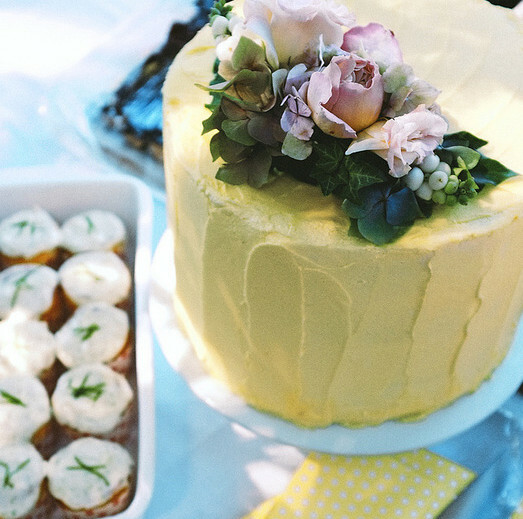 Take your icing, and add 1tsp of yellow food colouring. The colour should come out light and pastel. Start working the icing onto the sides of the cake. A good tip to remember is your icing spatula should only touch icing, never the cake. Once your cake is entirely covered in icing, with a clean spatula, starting from the bottom, wipe the icing upwards and work your way around the entire cake. Don’t worry about it looking too neat. This is not one of those cakes. You will have some excess icing around the top. Clean your spatula again, and working from the sides of the cake, slowly wipe the icing inwards. This method give you a nice clean edge. Work with the icing until you have the desired decorative effect, and YOU ARE DONE. Clean the edges of your cake tray with a warm wash cloth and pat yourself on the back. I used a fresh flower cake topper from the florist. You can pre-order these, or if you are so inclined you can attempt to make one yourself. Pop the cake in the fridge. I bet you’re glad you ate all your groceries on Monday and Tuesday. Now commence the un-holy job of cleaning up your kitchen and apologising to loved ones for hogging the kitchen for a whole week and acting like a royal turd. Also, don’t forget you have a wedding to attend in the morning. Go and steam your outfit and slap a face mask on!